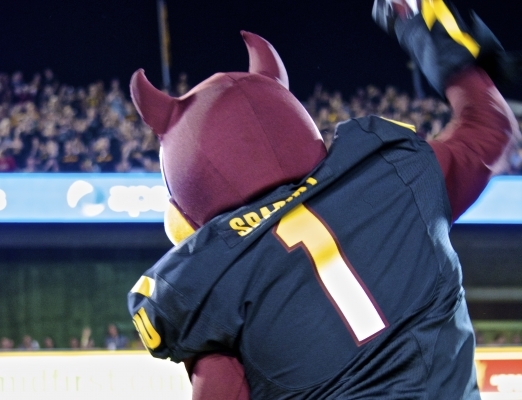 Tempe, AZ – ASU was able to squeak out a win against #20 Wisconsin last Saturday despite some glaring, yet fixable miscues. Looking back, there were plenty of positives to take from the Devils’ first signature win in several years, but there are some things that need to be cleaned up before heading into Palo Alto on Saturday for a clash with #5 Stanford. The upgrade to the receiving core for the 2013 season has been discussed ad nauseum over the off season. However, I counted no less than seven very catchable balls that were flat out dropped by receivers. Many of these routine catches would have resulted in first downs and extended drives. It won’t get any easier over the next three weeks and beyond, so mental toughness and deeper concentration are paramount if the Devils want to compete with the upper echelon of teams in the country. The lights will only get brighter this Saturday. 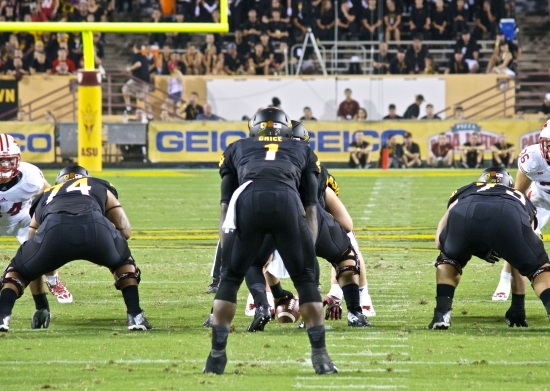 An ASU O-line with plenty of experience and excellent physical conditioning has yet to break open the inside running game in the first two contests. The Devils were able to use superior weapons and speed on the edges against Wisconsin, however, the Stanford defense has the speed, scheme, and discipline to run with the anyone in the country. ASU MUST be successful with a balanced attack to keep the Cardinal offense honest if they want to attack from all angles. Much to the surprise of everyone from college football analysts to the average fan, the ASU defense was stout against the much heralded between-the-tackles running game that Wisconsin brought to Tempe. Stanford is another team with a smash-mouth running mentality, but also has a better receiving core than ASU has shown to this point. Reading keys and reacting quicker will be the main factors to slowing down a Cardinal offense that is as balanced as it gets through two games (412 yds passing, 395 yds rushing). There were questionable plays that were either called or not called throughout the game. It wasn’t until a scoring drive in the 3rd quarter that Taylor Kelly executed the back-shoulder fade to Jaelen Strong multiple times. But that match up had been open all night against a smaller, back up cornerback who was in single coverage against the bigger and faster Strong. Also questionable was an incomplete 2nd down pass attempt when ASU was up by two and needed to bleed the clock. There were under two minutes in regulation when this play was called in. It resulted in a 3rd down and long, and more importantly stopped the clock – not a good development for ASU. 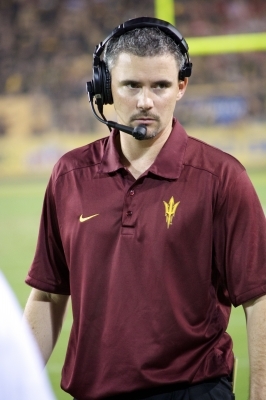 Coach Graham has since stated his displeasure in both of these situations, and I expect that more conventional calls will be made against Stanford this week if ASU hopes to come away with another victory. Wisconsin provided a glimpse into the physicality that ASU can expect heading to “The Farm” this weekend. The Devils also proved that they can be as physical as needed to pull out a victory. Mental errors and lack of concentration won’t be overcome against the defending Pac-12 and Rose Bowl champions. If the Devils can learn from their mistakes from last Saturday, I see no reason that they can’t find success against #5 Stanford. How much success is the big question.